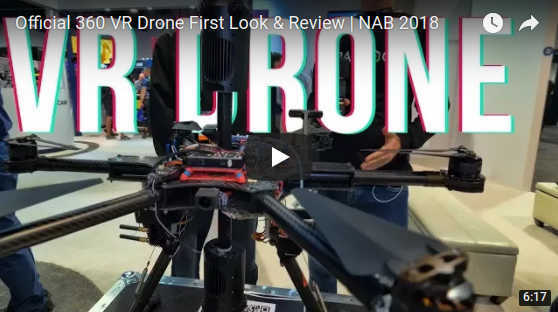 One of the most exciting announcements from NAB Show 2018 is a drone that’s designed to be used with any 360 camera. The drone will be invisible in the 360 video, and moreover, the video will be stabilized straight out of the camera. Here’s a video demo! I’ve previously posted ways to mount a 360 camera to a drone. I’ve also posted about a few drones with built-in 360 cameras, such as the Spherie drone. The VR Drone, on the other hand, is a purpose-built drone designed from the ground up for 360 cameras. The design is essentially a drone built around a double 360 camera gimbal. Because there is a camera above and below the VR Drone, the drone can be cloned out of the video and can appear invisible. Moreover, the VR Drone stabilizes the cameras, keeping them constantly vertical no matter which direction the drone flies. By using two cameras, the cameras effectively serve as counterweights for each other (therefore it is unnecessary to add counterweights). In addition, the center of gravity of the drone is balanced at its center, as opposed to being off-center when a gimbal and camera are mounted on a drone. The configuration shown in the video (hexacopter) that can support two Z Cam S1 cameras costs $7,500. As mentioned in the video, they can create other configurations for smaller or larger cameras. Anyway if you’re interested in the VR Drone, check out its manufacturer, ATI (Aerial Technology International). Mic, This is sweet!!! I would imagine that prices will come down as others come up with similar designs. But the COG based gimbal is absolutely brilliant. Yes i really wish i could afford it! I also wish regulations for flying drones would be more predictable…! Cool tech on display there. Being able to fly something like that in realtime FPV with a VR headset would be amazing!